eaw029092 ENGLAND (1950). Immingham Dock, Immingham, 1950. This image was marked by Aerofilms Ltd for photo editing. Title [EAW029092] Immingham Dock, Immingham, 1950. This image was marked by Aerofilms Ltd for photo editing. Location of the gun pits for a 2ndWW HAA Gun Battery at Immingham (GDA Humber), designation number L/-. The corner as shown here is "flat." At a later date - mid to late 1950s - it had a built-up camber made on the outer edge to help road tankers get round. This was a large raw-sewage tank that extended from below ground to well above ground. Looking in the various grids on top was like looking into the abyss! All was fairly still until the pumps started up in the pump house, and then the whole lot move northwards to the Humber! The approximate position of Queens Road tram stop. The lines to this stop were laid and the posts which supported the overhead wires can be seen on this photo, but no fare-paying passenger was ever carried. A "proving car" ran from "Immingham Town" (NOT Immingham Village!!) every so many months for many years to keep the right of way, but no service was ever provided. The metalwork was given for the war effort in WW2 and all trace was removed by 1955. Five coal hoists in a row along the quayside, all for exporting coal. By 2000 Immingham was a major coal importer. Fisons Ltd, a major investment after WW2. 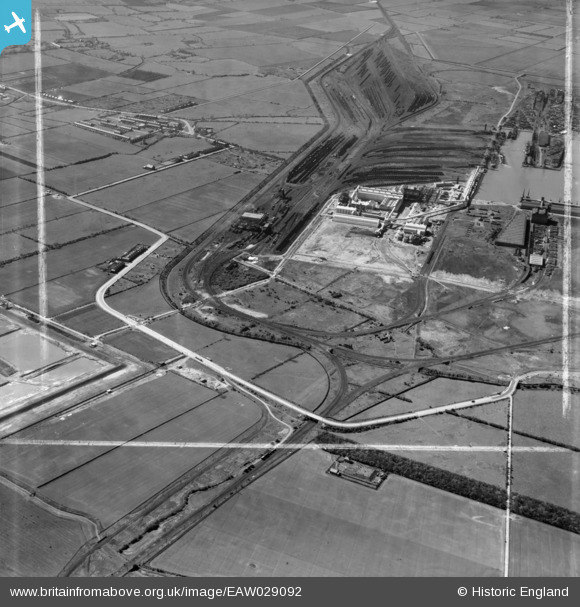 Other new industries were attracted to the south bank of the Humber from Killingholme to Grimsby. The duly supplanted the original industries of coal export and fishing. "The Barracks": accommodation available for train crew on "lodging turns", ie where they could stay overnight when they had travelled to Immingham one day and were due to return to their base - such as London - the next day. Grimsby District Light Railway; still there in the 2016 resignalling scheme. My late Mum, an Immingham girl, daughter of a life-long platelayer on the railway - referred to it as "Tramcar Hill" or sometimes "Tramcar Bridge". I never heard her use the modern abbreviation "Tram", always "Tramcar" or "Car". Thank you for evoking such happy memories. Apparently before WWII this Immingham Town shelter was a wooden shed, but it was decided during the war that a little extra protection might be wise because of the bombing of the docks, so this structure with a concrete roof was built. Compressor Station. This facility pumped raw sewage from Immingham into the Humber. Yes, still there in 2012, filled with rubbish, but still there. The brick shelter (still there in 2012, filled with rubbish, but still there) can be seen near the pin. A tramcar can also be seen reversing, which they all had to do, whether coming from or going to Grimsby. This halt (known locally as "Tramcar Halt") was officially known as "Immingham Town", despite being a good windswept mile from the village.